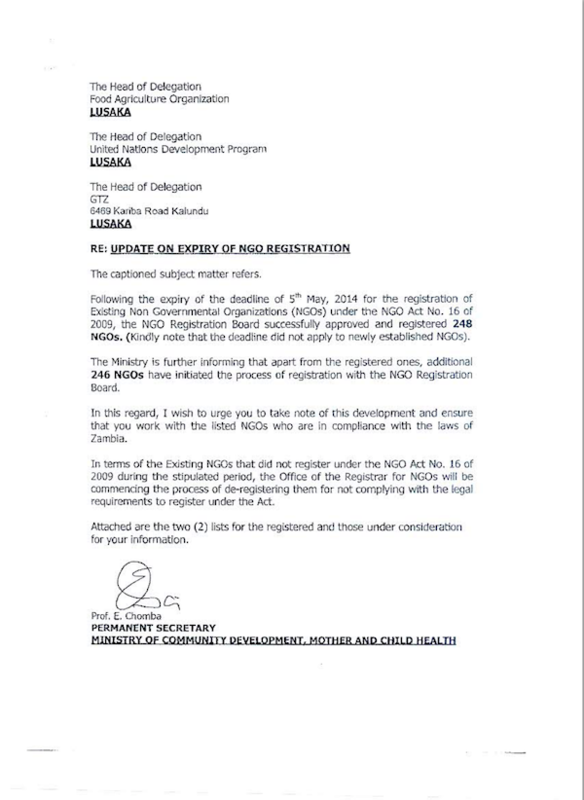 The PF government through the Ministry of Community Development has written to almost all diplomatic missions in Zambia asking them to stop supporting NGOs not registered under the draconian NGO Act. But sources at the Ministry of foreign affairs says the letter is nothing but a national embarrassment and betrays lack of coordination and collaboration in government. Further, sources in embassies have told the Watchdog that no embassy or foreign mission will honour the request from the PF regime as donors do not support the new NGO law. The NGO law which the PF is pushing requires NGOs to re-register every five years and to submit annual information on their activities, funders, accounts, and the personal wealth of their officials. The PF has created a board comprising mainly government officials. The board has power to approve the area of work of NGOs, that is, thematic and geographic areas of functioning. The board has power to cancel the certificate of an NGO that fails to meet the requirements above. 1. The letter is first of all a violation of diplomatic etiquette. The ministry that deals directly with diplomatic missions is the Ministry of Foreign Affairs. If MCDMCH has an issue to deal with diplomats, proper government procedure is to bring it to the attention of Ministry of Foreign Affairs and it is Foreign Affairs that has the competence to engage with diplomats directly. 2. In engaging with the diplomatic community, the standard method is the issuance of Diplomatic Notes (Dip-note) and note a casual letter, like this one signed by Elwyn Chomba (PS). 3. The letter shows lack of seriousness by government officials. Several diplomats are addressed by the wrong titles. For example, there is no one called the “Head of Delegation” at the USA Embassy, the World Bank, the Africa Development Bank, or at the British High Commission. As if this is not enough, some missions are listed multiple times: the Americans appear three times, and the Canadians twice. Embassies that no longer exist in Zambia, such as the Danish Embassy, are also addressed. This is the highest level of incompetence. They could have checked with Ministry of Foreign Affairs for the correct way of handling things. 4. The letter says the ministry is going to de-register NGOs that are not yet registered. This is nonsense both in law and in ordinary language. What kind of professor is Elwyn Chomba to have signed that letter? Did she even read it? At law they say Nemo dat quod non habet. Simply meaning, you cannot give what you don’t have. Similarly, you cannot de-register what you did not register in the first place. 5. The letter is poorly researched at law and if MCDMCH carries out its threat and throws NGOs into extinction, that will have many unintended ramifications, beyond the nose of poorly researched politicians and a few desperate civil servants. This could affect not just the reputation of the country but the relations with other countries and their support to Zambia. For example, the US government, under the Millennium Challenge Compact Programme, is supporting the Zambian people in the area of infrastructure, water and sanitation. An Act of Parliament was passed to this effect called the Millennium Challenge Compact Act of 2013. The Act clearly provides for NGOs to play a role in that and section 5 of the Act expressly names the Executive Director of NGOCC and the Civil Society for Poverty Reduction (CSPR)as board members. If these NGOs are “de-registered”, to use the incompetent word by the MCDMCH, that surely will have effect on the implementation of the more than USD300 million US support to Zambia.